Life and Hope Association (LHA) was established in 2005 by the monks of Wat Damnak temple and is run by the monks today. Initially it started from one project – Food for Education – and eventually grew into six large projects. One of the key people behind the establishment of LHA was Ven. Somnieng – the deputy head monk of Wat Damnak temple. Ven. Somnieng grew up in a poor family. His step-father was an abusive person and so his mother decided to send him to another family that he could get education. In this way, he completed a primary school, but because his family did not have money, he could not proceed to a junior high school. Ven. Somnieng was, however, a very determined child and despite his mother’s objections, he decided to become a monk, so that he could continue his education. Against all odds and difficulties, he completed high school and later got an opportunity to study Business Management at St. Ambrose University in the U.S. Being himself from a poor family and having faced many difficulties in getting education, Ven. Somnieng started caring about poor and disadvantaged people in his community. While studying for his Bachelor’s degree, he continued managing LHA projects from the U.S. and after graduation in May 2010 he returned back to Cambodia to continue helping people in need. Many people were inspired by Ven. Somnieng’s personality and the work of LHA and offered their helping hand. The LHA and its projects that we see today are the result of a hard and dedicated work of Ven. Somnieng, other monks and members of LHA staff, and many other generous people, who have contributed with their work or money. 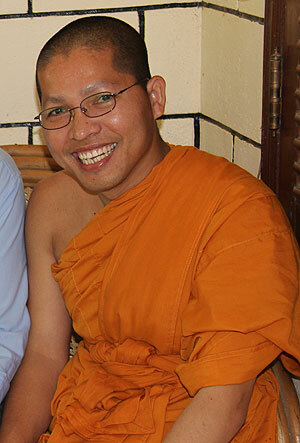 Venerable Somnieng describes the philosophy, objectives, and programs of LHA in this video.